"No, don’t eat! You’ll vomit if you eat. It’s suffering.” On November 27 evening, a mid-aged mom was trying to appease her three-year-old girl Shu Rong at Yunnan Fuwai Cardiovascular Hospital. The doctor said the kid will be operated nest day and eating is not allowed. Born in a village in west Yunnan’s Longchuan County, the little girl, who has a Chinese dad and a Myanmar mom, suffers congenital heart disease (CHD). 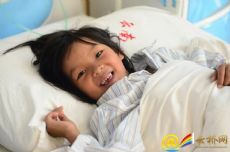 Recently, Shu Rong was on a free-cure program in Kunming, and in the past 6 days she has adapted to the new environment, playing with other kids and getting familiar with the nurses. "She is very cooperative during the check-ups, and we all adore her a lot,” said the nurse in charge of Shu Rong. “We really wish she could be better soon and free from the suffering.” On the morning of the surgery day, the nurse looked excited, while expecting. “Saying good-bye to her parents, Shu Rong has been accompanied by the nurse, who either told stories or talked with her. “Shu Rong has been very brave! She didn’t nag or cry," said the nurse. In the lounge where the waiting hours annoy most folks, the little girl showed calm. Knowing it is surgery day, Shu Rong’s grandma call early in the morning from Myanmar. "Follow the doctor, get better soon, and I’ll come to see you at your return.” Hearing grandma's words, Shu Rong nagged a little: "Mother, I want to go home! " 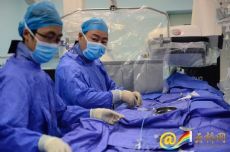 Professor Zhang Gejun, also the chief surgeon, said the little girl suffers from atrial septal defect (ASD). An interventional therapy is needed. Fully prepared and accompanied by the family, Shu Rong was slowly pushed to the operating room at around 10:00. One hour later, she was escorted out of the room. Seeing her child, the mother can’t help breaking into tears. "The doctor said it is a success, and we finally relieved,” said the mother, adding she will soon share the good news with other family members in Longchuan on the phone. 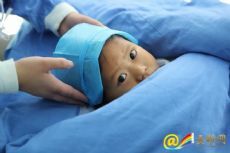 As of Nov. 28, five CHD kids from Longchuan have been operated and their current vital signs are stable,” said Chen Xiaowen, chief nurse of the Yunnan hospital. More children with congenital heart disease will be cured after physical check ups. Since Yunnan Fuwai Cardiovascular Hospital and Yunnan Daily Press Group kicked off a free-cure program for CHD kids in Dehong Prefecture on November 20 morning, 36 cases have been identified, involving 11 from Longchuan, 10 from Yingjiang, nine from Lianghe and six from Mangshi. All medical costs will be covered by medicare programs and foundations.